Settling into LaRue County, Ky., Ryan Bivens was looking for land. He farmed an hour away from his new home in Hodgenville. But he was starting fresh here in central Kentucky, the place of Abraham Lincoln's birth. He and his wife, Misty, had moved to the community because of her new position as agriculture teacher at LaRue County High School. Now, these first-generation farmers–newly married, by the way–were looking to farm in a county where neither had family or a banker, and spare money was something of a luxury. It was 2001. Corn was selling for $2 a bushel, soybeans $6. Ryan was 22, and Misty was 23. Creatively, Ryan turned first to the LaRue County Herald. He introduced himself in a classified advertisement as a "young, energetic farmer looking to cash lease ground." It worked. He picked up 500 acres. The Bivens farm has grown both as a family–sons Cyrus and Avery are 4 years old and 15 months, respectively–and as a business. The farm is 5,400 acres of corn, soybeans and wheat, and 68 landlords. Ryan has infused the operation with technology–auto tracking, boom controls, variable rate and row shutoffs. They operate 300,000 bushels of grain storage with a high-capacity tower dryer. The Bivens and a partner also have secured all the permits required to build a 4,000-head dairy operation. From day one, it will be the largest dairy in Kentucky and a hungry market for Ryan's grain. The Bivens hope to build in two or three years. The farm has not grown without bumps. The young couple was staring at a steep climb to farming their first row of corn, although both had some farming in their blood. Misty grew up on a cattle and tobacco farm. Ryan's father was in the propane business. His mother had a teaching degree. The family farmed a bit of tobacco. Ryan gained more experience working for local producers during high school. By graduation from the University of Kentucky, he was renting 700 acres in Spencer County, about 70 miles from their current farm. For two years, he spent hours driving between farms along the Martha Layne Collins Blue Grass Parkway. 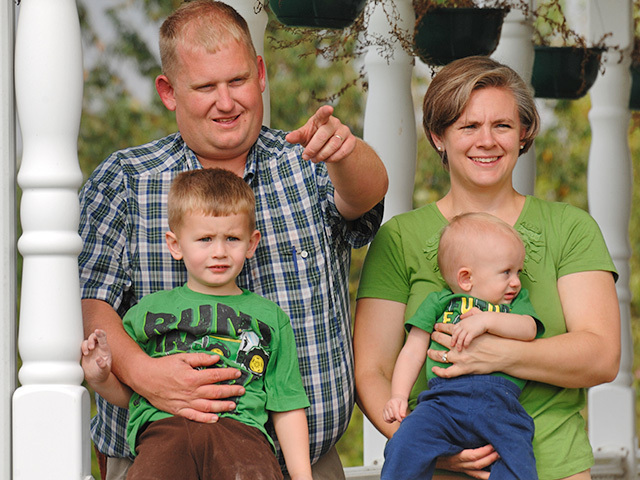 Moving to Hodgenville, the Bivens set out to connect with the community–volunteering, serving on committees and sending Christmas cards. It was no more complicated than honoring the Golden Rule. "I may not do this job any better [than others]. But we treat people well. I make my rent payments. I take time to talk with the older farmers," Ryan says. The Bivens recognize they have been aggressive in renting land, but they have never taken a farm away from another producer. "I pride myself in that," Ryan says. "We had to develop relationships," he says, with residents of the community, with landowners, lenders, with the managers of government programs. "But now we've picked up ground that wasn't offered to anyone else." Ryan shows pride in his work. Along roadsides bordering his mostly rented fields, he erects large signs that state: "Another quality crop produced by Bivens Farms" and his phone number. As his reputation has grown. New landlords see value in being associated with his practices–and having those signs planted alongside their fields. "This is our tenth crop," Ryan says of the 2011 harvest, "and we've grown tenfold." Ryan and Misty see much more farming ahead of them. It will be built on opportunity and relationships. "I don't have a goal for how many acres I want to farm," Ryan says. "But the possibilities are endless."